Ackee and Saltfish is Jamaica’s national dish, as we’ve written about in the past on our blog. We proudly serve it in our restaurant to rave reviews from our guests, many of whom have never tasted anything like it before. In fact, so many of our guests have asked for our delicious Ackee and Saltfish recipe that we decided to share it here along with a bit of its history. We are thrilled to give you the opportunity to bring a taste of Jamaica right into your home! Neither ackee nor salt cod is native to Jamaica, but they are both intimately entwined with Jamaican history. It’s the marriage of these two foods that makes them so uniquely Jamaican and so emblematic of the taste of Jamaica. Both ackee and salt cod arrived in Jamaica in the 18th century and both have connections to the slave trade. Ackee came from Ghana, most likely on a slave ship in the mid 1700s. 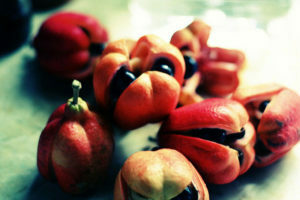 The name, ackee, is similar to it’s original name in the Ghanaian Twi language: ankye. The ackee evergreen tree thrives here, growing as tall as 50 ft (15.24m) and bearing clusters of fruit that resemble large red peppers. When ripe, the fruit splits open to reveal 3 or 4 sections of cream-colored arilli sitting on top of a bed of large, shiny black seeds. The arilli look somewhat like a brain, hence one of the common names of the fruit: the Vegetable Brain. This is the edible portion. Care must be taken to consume only the arilli of the fully ripe fruit as the unripe fruit is poisonous. Canned ackee is also available. Saltfish (or salt fish, depending where you’re from) arrived in Jamaica about the same time as ackee, also through the slave trade, as a cheap source of protein that could survive the trip across the Atlantic. This method of fish preservation is extremely practical in Jamaica’s hot, humid climate and transformed the local diet. Ackee and Saltfish is usually served for breakfast. 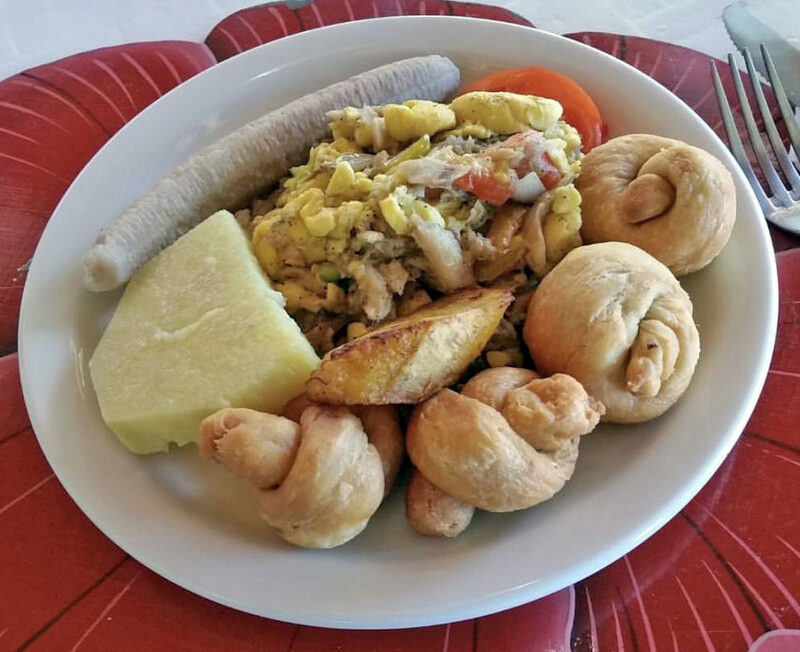 Soaked saltfish and ackee arilli are sautéed together with vegetables and seasonings and served alongside boiled green bananas, yam and jonnycakes (flour, a little baking powder & salt & water). This is mixed together, twirled and fried. Ackee turns a bright yellow when it is done and resembles (but doesn’t taste like) scrambled eggs. Without further delay, here’s our recipe. Enjoy! We are getting hungry just writing about it! How did our Ackee and Saltfish Recipe Taste? After you try our recipe at home, let us know what you think! Leave comments below or review our recipe (as well as your experience at our resort) on our Facebook page.